"Pure play" is an investment term that refers to a company which is exclusively focused on a particular product or service. An investor buys stock in pure play companies in order to obtain a market share in the industry as well as in the company. Robotics, to many, are just a tool to accomplish business tasks in an efficient way. To me, making robots to achieve those goals is an industry in itself and deserving of consideration for investment because of good prospects for the future. Hence the need to find pure play companies in the industry. For example, iRobot (IRBT:US) and KUKA (KU2:GR) are pure plays while Boeing (BA:US) and John Deere (DE:US) are not; yet all four companies are involved with robotics. In the case of Boeing and John Deere, robotics is not their primary business and represents just a tiny fraction of their operating profits. Boeing designs and manufactures UAV's for defense agencies and John Deere produces a line of AGV's including a new robotic lawn mower, and also provides autonomous navigation modules for tractors; but neither is truly a robotics company. Consequently, if you believe that the robotics industry is ready for you to invest in, you wouldn't purchase either Boeing or John Deere -- they aren't representative of the industry and their stocks move to the beat of a different drummer than robotics. Instead, you would pick from a list of pure play robotic stocks (if such a list existed). Emerging non-industrial robotics is a global industry stemming from entrepreneurial and university spin-off activities in the US, Europe, Korea, Japan and more recently, Taiwan and China. There is no center, although America is leading the pack at present. Conversely, industrial robotics clusters are located in Germany, Korea and Japan. America, which started the industry, is no longer its leader. Last year an analyst provided a list of 10 robotic stocks. Only four were realistic picks to watch and one was an outright mistake. This year Robotics Business Review produced a list of 19 public stocks but included 8 which were certainly not pure plays: ABB (ABBN:VX), Boeing (BA:US), John Deere (DE:US), Epson (6724:JP), Honda (7267:JP), Microsoft (MSFT:US), Panasonic (6752:JP) and Toyota (7203:JP). Each (except ABB which gets 21%) has a 5% or lower involvement in robotics; two don't manufacture robots at all; most are users of robots; and none of them are pure plays. Thus, compiling a list of pure play stocks and picking favorites is complex and rigorous. ABB is a perfect example of the complexity: they are one of the top global robot manufacturers yet their revenue from robotics represents just 21% of their overall business because ABB also builds power and control systems (generators, turbines, etc.). For three and a half years I have tracked and compiled a global and growing list of publicly-traded stocks involved in the robotics industry, stocks which are listed on reputable exchanges require regular, audited financial disclosure. I've separated them into three groups: industrial, service (which includes defense and space, medical and everything else non-industrial) and ancillary (which covers integrators, consulting firms, component suppliers, vision systems and software providers). I've individually weighted each stock by its closeness to being a pure robotic play based on their financial records and websites and have built the top 100 into an index which I call Robo-Stox™. 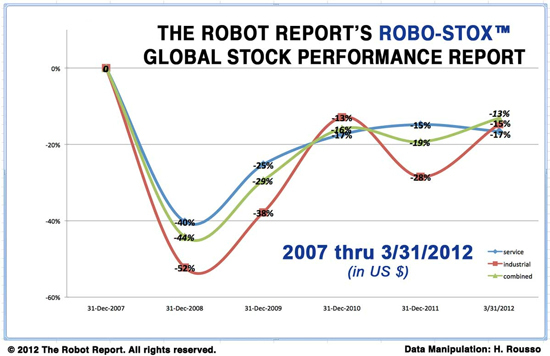 Each month I've produced a chart of the Robo-Stox™ index showing month-to-month and year-to-date changes and each year I've created a chart showing how the stocks performed over the years since their 2007 highs. Intuitive Surgical (ISRG:US) and its da Vinci Robotic Surgical System are being installed at major hospital operating centers worldwide. Its stock has risen over $200 in the last 12 months! Intuitive Surgical has more than 870 U.S. and foreign patents as well as more than 990 pending. Mako Surgical (MAKO:US) has an interactive robotic arm orthopedic system for knee implants. Accuray (ARAY:US) and its CyberKnife Robotic Radiosurgery System is an up-and-coming robotic radiation treatment system. Swisslog (SLOG:SW) makes warehouse automation devices as well as hospital logistics and drug management solutions using mobile robots. Mazor Robotics (MZOR:IL), an Israeli company, provides state-of-the-art robotic surgical guidance systems. UAS (unmanned aerial systems) sales. They regularly get DoD orders for their Raven and Wasp small unmanned aircraft systems and just got three orders totaling $28.4 million for production of their Puma drone. iRobot (IRBT:US), a 100% pure play robotics company, just had a 33% drop in their stock price because of reduced government contracts. They have recently restructured to add healthcare to their lineup of products, consumer products are doing fine, and the company is fishing for additional consumer robotic products. QinetiQ (QQ/:LN) is iRobot's direct competitor in the defense robotics marketplace despite their being a British company and not a pure play stock. Adept Technology (ADEP:US) is one of the very few industrial robot manufacturers based in the U.S. Most of it's revenue from robotics comes from manufacturing, food processing, automotive and warehousing applications. With their recent acquisition of Mobile Robotics, and after strengthening and modularizing their mobile acquisition,the company began to enter the service robotics sector. Two privately held companies, Universal Robotics, a Danish company and c-Link Systems, from the US, along with two publicly-traded companies KUKA (KU2:GR) and ABB (ABBN:VX), have released lightweight, economical, safe, robotic arms for light industrial and SME work. KUKA (KU2:GR) has been getting a lot of press for their increasing involvement in China, too. All these companies (KUKA, ABB, FANUC, Adept, Yaskawa Electric (Motoman)) hope to do well in China as China automates its automotive and other industries. But KUKA and the other non-Chinese companies may have problems further down the road when China's in-country technology machine takes over. ABB (ABBN:VX) has for many years been active in China and, until Foxconn announced that they would be manufacturing their own robots, ABB was rumored to be the leading contender to get the job. ABB stock comes with the caveat that robotics represents only 21% of their corporate revenue. Yaskawa Electric (Motoman) (6506:JP) is similar to ABB in that the company is well respected as a robot manufacturer yet robotics represents only 30% of revenues. They recently announced building plans for a robot factory in China. FANUC (6954:JP) recently completed construction of an additional factory in Japan to handle sales to China. Foxconn, is an example of how the industry may shift to China and cut out foreign competitors. Hon Hai Precision (2317:TW), a holding company for Foxconn and a buyer of 10,000 industrial robots from a variety of vendors, is one of China's largest manufacturers, employing over 1 million workers in China alone. Foxconn is planning to make and install their own robots with an ambitious plan to install 1 million robots within 3 years! And then they'll begin selling robots to others! * Some of the major industrial robotics providers are wholly-owned subsidiaries of publicly-traded companies and not listed here because of that. An example is Comau Robotics, a wholly-owned subsiciary of Fiat Group. Many of the car companies have in-house robotics groups, e.g. : GM, Honda and Toyota. Conversely, both ABB and Yaskawa Electric are listed because their other activities complement, for the most part, the industries that are likely to be robot users. FARO Technologies (NASDAQ:FARO) provides 3D measurement and inspection arms and scanners. Cognex (NASDAQ:CGNX) is a provider of machine vision products primarily used in robotic applications. Allied Motion Technologies (AMOT:US) makes the servos that are incorporated in the da Vinci surgical and other robotic systems. Recently I've come across a couple of dubious stocks that I have questions about and think need watching: QUAN and ALF. Neither is traded on an exchange which requires financial reporting, and from what I can tell by the information on the Internet, they both appear to be set up so that if you buy their stock, they get the money - in effect, they are the seller. That is not the usual way we think of stock trading but it appears to be the way they are both operating. Artificial Life Source Holding, PLC, (ALF:GR) on the Frankfurt Stock Exchange, has parlayed a set of human-robot communication software routines which were developed by their CEO into a niche company with polished marketing materials. Their robotic products consist of the original software and a $10,500 teddy bear that talks, has facial expressions and arm movements. In videos, the little bears are used to teach elementary language and spelling to children. The CEO says he has an order for 10,000 robots. That's a $105 million transaction but he also said he hasn't yet finalized the product, the production methods, the engineering, the software or the choice of vendor(s). Yet the company has a publicly-traded stock. Interestingly, the market value of the company is given as the sum of the shares sold times the current price of the stock. Quantum International Corp, (QUAN:US) in the Pink Sheets, an exchange which doesn't require any financial disclosure or regular reporting to be listed, appears to be promoting itself to investors as a venture company specializing in robotics. Their website is full of information about why robotics are a good investment but their suggestion seems to be that you invest with them and they will act as a venture capitalist on your behalf. Their new CEO recently moved from being the CEO of an energy company which shut down. That company's stock was renamed from First Titan Corp. to Quantum International Corp. Thus both the old stock and its CEO appear to be trying their luck in robotics just as they did in the development of oil and gas exploration. This article is a reprinted with permission from Frank Tobe and his site The Robot Report.